The innate immune system, also known as the non-specific immune system or in-born immunity system, is an important subsystem of the overall immune system that comprises the cells and mechanisms that defend the host from infection by other organisms. The cells of the innate system recognize and respond to pathogens in a generic way, but, unlike the adaptive immune system, the system does not confer long-lasting or protective immunity to the host. Innate immune systems provide immediate defense against infection, and are found in all classes of plant and animal life. Anatomical barriers include physical, chemical and biological barriers. The epithelial surfaces form a physical barrier that is impermeable to most infectious agents, acting as the first line of defense against invading organisms. Desquamation (shedding) of skin epithelium also helps remove bacteria and other infectious agents that have adhered to the epithelial surfaces. Lack of blood vessels and inability of the epidermis to retain moisture, presence of sebaceous glands in the dermis provides an environment unsuitable for the survival of microbes. In the gastrointestinal and respiratory tract, movement due to peristalsis or cilia, respectively, helps remove infectious agents. Also, mucus traps infectious agents. The gut flora can prevent the colonization of pathogenic bacteria by secreting toxic substances or by competing with pathogenic bacteria for nutrients or attachment to cell surfaces. The flushing action of tears and saliva helps prevent infection of the eyes and mouth. The process of acute inflammation is initiated by cells already present in all tissues, mainly resident macrophages, dendritic cells, histiocytes, Kupffer cells, and mastocytes. These cells present receptors contained on the surface or within the cell, named pattern recognition receptors (PRRs), which recognize molecules that are broadly shared by pathogens but distinguishable from host molecules, collectively referred to as pathogen-associated molecular patterns (PAMPs). At the onset of an infection, burn, or other injuries, these cells undergo activation (one of their PRRs recognizes a PAMP) and release inflammatory mediators responsible for the clinical signs of inflammation. Chemical factors produced during inflammation (histamine, bradykinin, serotonin, leukotrienes, and prostaglandins) sensitize pain receptors, cause local vasodilation of the blood vessels, and attract phagocytes, especially neutrophils. Neutrophils then trigger other parts of the immune system by releasing factors that summon additional leukocytes and lymphocytes. Cytokines produced by macrophages and other cells of the innate immune system mediate the inflammatory response. These cytokines include TNF, HMGB1, and IL-1. possible dysfunction of the organs or tissues involved. rid the body of neutralised antigen-antibody complexes. Elements of the complement cascade can be found in many non-mammalian species including plants, birds, fish, and some species of invertebrates. 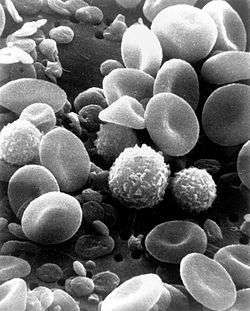 A scanning electron microscope image of normal circulating human blood. One can see red blood cells, several knobby white blood cells including lymphocytes, a monocyte, a neutrophil, and many small disc-shape platelets. All white blood cells (WBCs) are known as leukocytes. Leukocytes differ from other cells of the body in that they are not tightly associated with a particular organ or tissue; thus, their function is similar to that of independent, single-cell organisms. Leukocytes are able to move freely and interact with and capture cellular debris, foreign particles, and invading microorganisms. Unlike many other cells in the body, most innate immune leukocytes cannot divide or reproduce on their own, but are the products of multipotent hematopoietic stem cells present in the bone marrow. The innate leukocytes include: Natural killer cells, mast cells, eosinophils, basophils; and the phagocytic cells include macrophages, neutrophils, and dendritic cells, and function within the immune system by identifying and eliminating pathogens that might cause infection. Mast cells are a type of innate immune cell that reside in connective tissue and in the mucous membranes. They are intimately associated with wound healing and defense against pathogens, but are also often associated with allergy and anaphylaxis. When activated, mast cells rapidly release characteristic granules, rich in histamine and heparin, along with various hormonal mediators and chemokines, or chemotactic cytokines into the environment. Histamine dilates blood vessels, causing the characteristic signs of inflammation, and recruits neutrophils and macrophages. The word 'phagocyte' literally means 'eating cell'. These are immune cells that engulf, or 'phagocytose', pathogens or particles. To engulf a particle or pathogen, a phagocyte extends portions of its plasma membrane, wrapping the membrane around the particle until it is enveloped (i.e., the particle is now inside the cell). Once inside the cell, the invading pathogen is contained inside an endosome, which merges with a lysosome. The lysosome contains enzymes and acids that kill and digest the particle or organism. In general, phagocytes patrol the body searching for pathogens, but are also able to react to a group of highly specialized molecular signals produced by other cells, called cytokines. The phagocytic cells of the immune system include macrophages, neutrophils, and dendritic cells. Phagocytosis of the hosts’ own cells is common as part of regular tissue development and maintenance. When host cells die, either by programmed cell death (also called apoptosis) or by cell injury due to a bacterial or viral infection, phagocytic cells are responsible for their removal from the affected site. By helping to remove dead cells preceding growth and development of new healthy cells, phagocytosis is an important part of the healing process following tissue injury. Macrophages, from the Greek, meaning "large eaters," are large phagocytic leukocytes, which are able to move outside of the vascular system by migrating across the walls of capillary vessels and entering the areas between cells in pursuit of invading pathogens. In tissues, organ-specific macrophages are differentiated from phagocytic cells present in the blood called monocytes. Macrophages are the most efficient phagocytes and can phagocytose substantial numbers of bacteria or other cells or microbes. The binding of bacterial molecules to receptors on the surface of a macrophage triggers it to engulf and destroy the bacteria through the generation of a “respiratory burst”, causing the release of reactive oxygen species. Pathogens also stimulate the macrophage to produce chemokines, which summon other cells to the site of infection. Neutrophils, along with two other cell types (eosinophils and basophils; see below), are known as granulocytes due to the presence of granules in their cytoplasm, or as polymorphonuclear cells (PMNs) due to their distinctive lobed nuclei. Neutrophil granules contain a variety of toxic substances that kill or inhibit growth of bacteria and fungi. Similar to macrophages, neutrophils attack pathogens by activating a respiratory burst. The main products of the neutrophil respiratory burst are strong oxidizing agents including hydrogen peroxide, free oxygen radicals and hypochlorite. Neutrophils are the most abundant type of phagocyte, normally representing 50-60% of the total circulating leukocytes, and are usually the first cells to arrive at the site of an infection. The bone marrow of a normal healthy adult produces more than 100 billion neutrophils per day, and more than 10 times that many per day during acute inflammation. Dendritic cells (DCs) are phagocytic cells present in tissues that are in contact with the external environment, mainly the skin (where they are often called Langerhans cells), and the inner mucosal lining of the nose, lungs, stomach, and intestines. They are named for their resemblance to neuronal dendrites, but dendritic cells are not connected to the nervous system. Dendritic cells are very important in the process of antigen presentation, and serve as a link between the innate and adaptive immune systems. 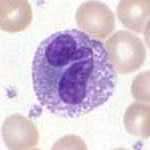 Basophils and eosinophils are cells related to the neutrophil (see above). When activated by a pathogen encounter, histamine-releasing basophils are important in the defense against parasites and play a role in allergic reactions, such as asthma. Upon activation, eosinophils secrete a range of highly toxic proteins and free radicals that are highly effective in killing parasites, but may also damage tissue during an allergic reaction. Activation and release of toxins by eosinophils are, therefore, tightly regulated to prevent any inappropriate tissue destruction. Natural killer cells (NK cells) are a component of the innate immune system that does not directly attack invading microbes. Rather, NK cells destroy compromised host cells, such as tumor cells or virus-infected cells, recognizing such cells by a condition known as "missing self." This term describes cells with abnormally low levels of a cell-surface marker called MHC I (major histocompatibility complex) - a situation that can arise in viral infections of host cells. They were named "natural killer" because of the initial notion that they do not require activation in order to kill cells that are "missing self." For many years, it was unclear how NK cell recognize tumor cells and infected cells. It is now known that the MHC makeup on the surface of those cells is altered and the NK cells become activated through recognition of "missing self". Normal body cells are not recognized and attacked by NK cells because they express intact self MHC antigens. Those MHC antigens are recognized by killer cell immunoglobulin receptors (KIR) that, in essence, put the brakes on NK cells. The NK-92 cell line does not express KIR and is developed for tumor therapy. Like other 'unconventional' T cell subsets bearing invariant T cell receptors (TCRs), such as CD1d-restricted Natural Killer T cells, γδ T cells exhibit characteristics that place them at the border between innate and adaptive immunity. On one hand, γδ T cells may be considered a component of adaptive immunity in that they rearrange TCR genes to produce junctional diversity and develop a memory phenotype. However, the various subsets may also be considered part of the innate immune system where a restricted TCR or NK receptors may be used as a pattern recognition receptor. For example, according to this paradigm, large numbers of Vγ9/Vδ2 T cells respond within hours to common molecules produced by microbes, and highly restricted intraepithelial Vδ1 T cells will respond to stressed epithelial cells. The coagulation system overlaps with the immune system. Some products of the coagulation system can contribute to the non-specific defenses by their ability to increase vascular permeability and act as chemotactic agents for phagocytic cells. In addition, some of the products of the coagulation system are directly antimicrobial. For example, beta-lysine, a protein produced by platelets during coagulation, can cause lysis of many Gram-positive bacteria by acting as a cationic detergent. Many acute-phase proteins of inflammation are involved in the coagulation system. Also increased levels of lactoferrin and transferrin inhibit bacterial growth by binding iron, an essential nutrient for bacteria. The innate immune response to infectious and sterile injury is modulated by neural circuits that control cytokine production period. The inflammatory reflex is a prototypical neural circuit that controls cytokine production in spleen. Action potentials transmitted via the vagus nerve to spleen mediate the release of acetylcholine, the neurotransmitter that inhibits cytokine release by interacting with alpha7 nicotinic acetylcholine receptors (CHRNA7) expressed on cytokine-producing cells. The motor arc of the inflammatory reflex is termed the cholinergic anti-inflammatory pathway. The parts of the innate immune system have different specificity for different pathogens. Cells of the innate immune system, in effect, prevent free growth of bacteria within the body; however, many pathogens have evolved mechanisms allowing them to evade the innate immune system. Evasion strategies that circumvent the innate immune system include intracellular replication, such as in Mycobacterium tuberculosis, or a protective capsule that prevents lysis by complement and by phagocytes, as in salmonella. Bacteroides species are normally mutualistic bacteria, making up a substantial portion of the mammalian gastrointestinal flora. Some species (B. fragilis, for example) are opportunistic pathogens, causing infections of the peritoneal cavity. These species evade the immune system through inhibition of phagocytosis by affecting the receptors that phagocytes use to engulf bacteria or by mimicking host cells so that the immune system does not recognize them as foreign. Staphylococcus aureus inhibits the ability of the phagocyte to respond to chemokine signals. Other organisms such as M. tuberculosis, Streptococcus pyogenes, and Bacillus anthracis utilize mechanisms that directly kill the phagocyte. Evasion of the innate immune system by virus. Type I interferons (IFN), secreted mainly by dendritic cells, play the central role in antiviral host defense and creation of an effective antiviral state in a cell. Viral components are recognized by different receptors: Toll-like receptors are located in the endosomal membrane and recognize double-stranded RNA (dsRNA), MDA5 and RIG-I receptors are located in the cytoplasm and recognize long dsRNA and phosphate-containing dsRNA respectively. The viral recognition by MDA5 and RIG-I receptors in the cytoplasm induces a conformational change between the caspase-recruitment domain (CARD) and the CARD-containing adaptor MAVS. In parallel, the viral recognition by toll-like receptors in the endocytic compartments induces the activation of the adaptor protein TRIF. These two pathways converge in the recruitment and activation of the IKKε/TBK-1 complex, inducing phosphorylation and homo- and hetero-dimerization of transcription factors IRF3 and IRF7. These molecules are translocated in the nucleus, where they induce IFN production with the presence of C-Jun (a particular transcription factor) and activating transcription factor 2. IFN then binds to the IFN receptors, inducing expression of hundreds of interferon-stimulated genes. This leads to production of proteins with antiviral properties, such as protein kinase R, which inhibits viral protein synthesis, or the 2′,5′-oligoadenylate synthetase family, which degrades viral RNA. These molecules establish an antiviral state in the cell. Some viruses are able to evade this immune system by producing molecules that interfere with the IFN production pathway. For example, the Influenza A virus produces NS1 protein, which can bind to single-stranded and double-stranded RNA, thus inhibiting type I IFN production. Influenza A virus also blocks protein kinase R activation and the establishment of the antiviral state. The dengue virus also inhibits type I IFN production by blocking IRF-3 phosophorylation using NS2B3 protease complex. In invertebrates, pattern recognition proteins (PRPs) trigger proteolytic cascades that degrade proteins and control many of the mechanisms of the innate immune system of invertebrates—including hemolymph coagulation and melanization. Proteolytic cascades are important components of the invertebrate immune system because they are turned on more rapidly than other innate immune reactions because they do not rely on gene changes. Proteolytic cascades have been found to function the same in both vertebrate and invertebrates, even though different proteins are used throughout the cascades. In the hemolymph, which makes up the fluid in the circulatory system of arthropods, a gel-like fluid surrounds pathogen invaders, similar to the way blood does in other animals. There are various different proteins and mechanisms that are involved in invertebrate clotting. In crustaceans, transglutaminase from blood cells and mobile plasma proteins make up the clotting system, where the transglutaminase polymerizes 210 kDa subunits of a plasma-clotting protein. On the other hand, in the horseshoe crab species clotting system, components of proteolytic cascades are stored as inactive forms in granules of hemocytes, which are released when foreign molecules, like lipopolysaccharides enter. Members of every class of pathogen that infect humans also infect plants. Although the exact pathogenic species vary with the infected species, bacteria, fungi, viruses, nematodes, and insects can all cause plant disease. As with animals, plants attacked by insects or other pathogens use a set of complex metabolic responses that lead to the formation of defensive chemical compounds that fight infection or make the plant less attractive to insects and other herbivores. (see: plant defense against herbivory). Most plant immune responses involve systemic chemical signals sent throughout a plant. Plants use pattern-recognition receptors to recognize conserved microbial signatures. This recognition triggers an immune response. The first plant receptors of conserved microbial signatures were identified in rice (XA21, 1995) and in Arabidopsis (FLS2, 2000). Plants also carry immune receptors that recognize highly variable pathogen effectors. These include the NBS-LRR class of proteins. When a part of a plant becomes infected with a microbial or viral pathogen, in case of an incompatible interaction triggered by specific elicitors, the plant produces a localized hypersensitive response (HR), in which cells at the site of infection undergo rapid programmed cell death to prevent the spread of the disease to other parts of the plant. HR has some similarities to animal pyroptosis, such as a requirement of caspase-1-like proteolytic activity of VPEγ, a cysteine protease that regulates cell disassembly during cell death. ↑ Grasso, P.; Gangolli, S.; Gaunt, Ian (2002). Essentials of Pathology for Toxicologists. CRC Press. ISBN 978-0-415-25795-4. Retrieved 30 August 2011. Our immune system is therefore crucial to our survival. It is currently divided into two categories which are innate (non-specific) immunity and acquired (specific) immunity. 1 2 3 4 Alberts B, Johnson A, Lewis J, Raff M, Roberts K, Walters P (2002). Molecular Biology of the Cell; Fourth Edition. New York and London: Garland Science. ISBN 0-8153-3218-1. 1 2 3 4 5 6 Janeway, Charles; Paul Travers; Mark Walport; Mark Shlomchik (2001). Immunobiology; Fifth Edition. New York and London: Garland Science. ISBN 0-8153-4101-6. .
1 2 3 4 5 6 7 Stvrtinová, Viera; Ján Jakubovský; Ivan Hulín (1995). Inflammation and Fever from Pathophysiology: Principles of Disease. Computing Centre, Slovak Academy of Sciences: Academic Electronic Press. ↑ Lotze, MT; Tracey, KJ (2005). "High-mobility group box 1 protein (HMGB1): nuclear weapon in the immune arsenal". Nature reviews. Immunology. 5 (4): 331–42. doi:10.1038/nri1594. PMID 15803152. ↑ Janeway, C.A. ; Travers, P.; Walport, M.; Shlomchik, M.J. (2005). Immunobiology. (6th ed.). Garland Science. ISBN 0-443-07310-4. ↑ Janeway, Charles (2005). Immunobiology. (6th ed.). Garland Science. ISBN 0-443-07310-4. ↑ Arai S, Meagher R, Swearingen M, et al. (2008). "Infusion of the allogeneic cell line NK-92 in patients with advanced renal cell cancer or melanoma: a phase I trial". Cytotherapy. 10: 625–32. doi:10.1080/14653240802301872. ↑ Tonn T, Becker S, Esser R, Schwabe D, Seifried E (2001). "Cellular immunotherapy of malignancies using the clonal natural killer cell line NK-92". J Hematother Stem Cell Res. 10: 535–44. doi:10.1089/15258160152509145. ↑ Gong J, Maki G, Klingemann H (1994). "Characterization of a human cell line (NK-92) with phenotypical and functional characteristics of activated natural killer cells". Leukemia. 8: 652–58. ↑ Tracey, KJ (2007). "Physiology and immunology of the cholinergic antiinflammatory pathway". The Journal of Clinical Investigation. 117 (2): 289–96. doi:10.1172/JCI30555. PMC 1783813 . PMID 17273548. ↑ Tracey, KJ (2009). "Reflex control of immunity". Nature reviews. Immunology. 9 (6): 418–28. doi:10.1038/nri2566. PMID 19461672. 1 2 3 4 Doan, Thao (2008). Immunology. Lippincott Williams & Wilkins. p. 172. ISBN 978-0-7817-9543-2. ↑ Finlay B, McFadden G (2006). "Anti-immunology: evasion of the host immune system by bacterial and viral pathogens". Cell. 124 (4): 767–82. doi:10.1016/j.cell.2006.01.034. PMID 16497587. ↑ Finlay B, Falkow S (1997). 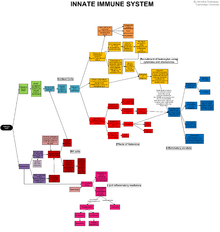 "Common themes in microbial pathogenicity revisited" (PDF). Microbiol Mol Biol Rev. 61 (2): 136–69. PMC 232605 . PMID 9184008. ↑ Dorland WAN (editor) (2003). Dorland's Illustrated Medical Dictionary (30th ed.). W.B. Saunders. ISBN 0-7216-0146-4. ↑ Kobayashi H (2005). "Airway biofilms: implications for pathogenesis and therapy of respiratory tract infections". Treat Respir Med. 4 (4): 241–53. doi:10.2165/00151829-200504040-00003. PMID 16086598. ↑ Le Bon A.; Tough D. F. (2002). "Links between innate and adaptive immunity via type I interferon". Curr. Opin. Immunol. 14: 432–436. doi:10.1016/s0952-7915(02)00354-0. 1 2 Akira S.; Uematsu S.; Takeuchi O. (2006). "Pathogen recognition and innate immunity". Cell. 124: 783–801. doi:10.1016/j.cell.2006.02.015. ↑ Baum A.; Garcia-Sastre A. (2010). "Induction of type I interferon by RNA viruses: cellular receptors and their substrates". Amino Acids. 38: 1283–1299. doi:10.1007/s00726-009-0374-0. ↑ Garcia-Sastre A.; Egorov A.; Matassov D.; Brandt S.; Levy D. E.; Durbin J. E.; Palese P.; Muster T. (1998). "Influenza A virus lacking the NS1 gene replicates in interferon-deficient systems". Virology. 252: 324–330. doi:10.1006/viro.1998.9508. ↑ Rodriguez-Madoz JR, Belicha-Villanueva A, Bernal-Rubio D, Ashour J, Ayllon J, Fernandez-Sesma A (2010). "Inhibition of the type I interferon response in human dendritic cells by dengue virus infection requires a catalytically active NS2B3 complex". Journal of Virology. 84 (19): 9760–74. doi:10.1128/jvi.01051-10. 1 2 Beck, Gregory and Habicht, Gail S. Immunity and the Invertebrates Scientific American. November 1996:60-66. ↑ Imler, JL; Hoffmann, JA (2001). "Toll receptors in innate immunity". Trends in Cell Biology. 11 (7): 304–11. doi:10.1016/S0962-8924(01)02004-9. PMID 11413042. 1 2 Cerenius L, Kawabata S, Lee BL, Nonaka M, Söderhäll K (October 2010). "Proteolytic cascades and their involvement in invertebrate immunity". Trends Biochem. Sci. 35 (10): 575–83. doi:10.1016/j.tibs.2010.04.006. PMID 20541942. 1 2 3 Schneider, David (2005) Plant immune responses Stanford University Department of Microbiology and Immunology. ↑ Song, W.Y. ; et al. (1995). "A receptor kinase-like protein encoded by the rice disease resistance gene, XA21". Science. 270 (5243): 1804–1806. doi:10.1126/science.270.5243.1804. PMID 8525370. ↑ Ronald, P.C. ; Beutler, B (2010). "Plant and animal sensors of conserved microbial signatures". Science. 330 (6007): 1061–1064. doi:10.1126/science.1189468. PMID 21097929. ↑ Gomez-Gomez, L.; et al. (2000). "FLS2: an LRR receptor-like kinase involved in the perception of the bacterial elicitor flagellin in Arabidopsis". Molecular Cell. 5 (6): 1003–1011. doi:10.1016/S1097-2765(00)80265-8. PMID 10911994. ↑ Rojo, E.; et al. (2004). "VPEgamma exhibits a caspase-like activity that contributes to defense against pathogens". Curr Biol. 14 (21): 1897–1906. doi:10.1016/j.cub.2004.09.056. PMID 15530390. ↑ "Linden, J., Stoner, R., Knutson, K. Gardner-Hughes, C. "Organic Disease Control Elicitors". Agro Food Industry Hi-Te (p12-15 Oct 2000)" (PDF). ↑ Baulcombe D (2004). "RNA silencing in plants". Nature. 431 (7006): 356–63. doi:10.1038/nature02874. PMID 15372043.